Saturday was the first Electronics Flea Market for 2008. We went, a little late as usual, but early for us. When we got our coffee and donuts at 8:30, there were already some vendors packing up; they had been there for hours and sold enough to call it a day. The weather was beautiful, and we all got sunburned, but we also took home a nice haul of goodies. 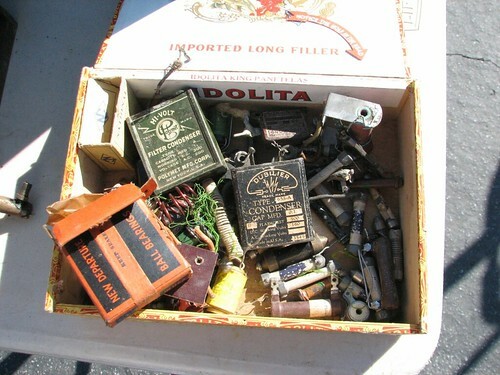 Above: the pretty stuff put in a cigar box for the benefit of photographers like me. We stopped by to see the solder people, who were getting out sponges for someone when we arrived. Everything they have is in a display like this; you should see their box of Metcal tips. We got some tips and solder and let them laugh at me for taking a picture of their box of sponges. Everyone was in a good mood; it was like old home week with all the guys catching up after being away for months. 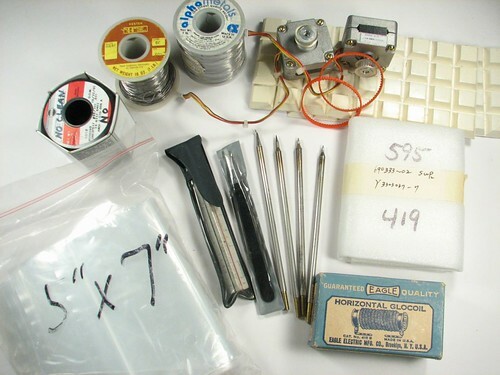 So, here’s our haul: solder, rubber feet, stepper motors, timing belts, a dichroic mirror, a heater coil in a beautiful box, Metcal soldering iron tips, a pair of tweezers, a ruler, and resealable plastic bags. I got a couple of ‘N’ cells, too, but they made it to the battery drawer before I got a chance to photograph the take. 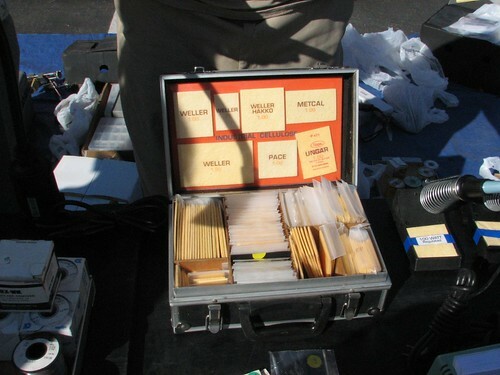 I’ve got a few more pictures from the flea market and a couple of close-ups in this flickr set. Windell’s pictures from last year are in this set. The next flea market is April 12. Mark your calendars! I would like to attend this, but if you included the location, I couldn’t find it.